This easy chicken casserole—also known as a hot chicken salad—can be made with lighter ingredients, and it makes a fabulous family meal. Serve this chicken with hot cooked rice or add cooked noodles to the dish (see the reader suggestions). Add a tossed salad and biscuits for a tasty meal. 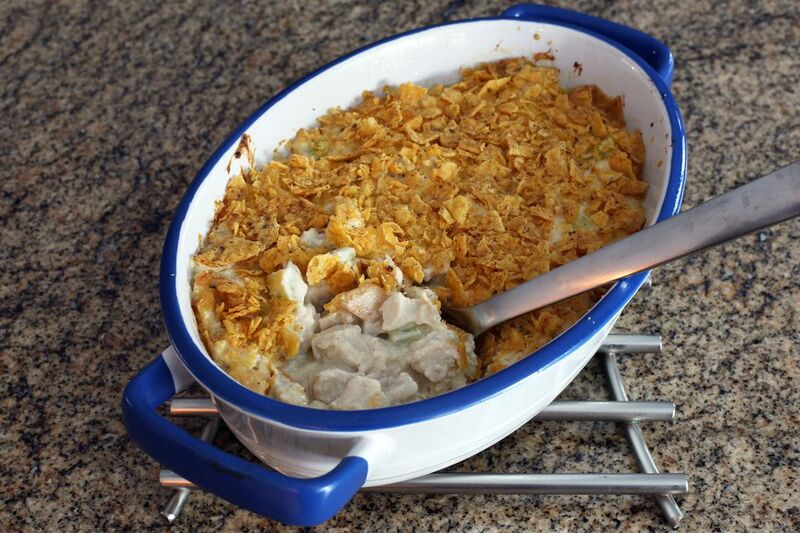 We topped our chicken casserole with "Cool Ranch" Doritos (pictured). Butter a 2 to 2 1/2-quart casserole dish. Cut cooked chicken into bite-size pieces. Mix chicken with remaining ingredients, except potato chips and paprika. Pour chicken mixture into the prepared casserole. Top with potato chips and sprinkle with the paprika. Bake, uncovered, in the preheated oven for about 30 to 40 minutes. Joan's Notes: This freezes well before or after cooking. This recipe is just as good with no- and low-fat ingredients. Enjoy!